I arrived at City Lit Theater’s space to see Black Button Eyes Productions’ “Coraline” a complete Neil Gaiman virgin. I’d heard that the novelist’s 2002 horror/fantasy novella was a more overtly twisted “Alice in Wonderland” literary romp, and never gave it a second thought. That is, until director Henry Selick’s 2009 stop-motion film adaption of “Coraline” was nominated for an Academy Award. Then I was nearly annoyed that what I had deemed to be a grotesque morsel of British-against-British thievery was continuing to occupy a place in popular culture. But composer Stephin Merritt and playwright David Greenspan’s musical rendering of Gaiman’s story has drawn me in, put me in my place. If Merritt’s notion of instrumental scoring for his music for “Coraline” (the young adventuress accompanied by toy pianos, the “real-world” grownups supported by a typical upright, and the “others” from behind the soon-to-be unlocked door singing over a baby grand with various found objects shoved between the piano strings) sounds like a 1970s music education thesis on new ploys for introducing young people to the orchestra, I found the actuality of it charming, and music director Nick Sula’s preparation and presentation, as always, terrific. And if the plot-line loses just a tiny bit of zip two-thirds of the way through, when the sung bits that come and go so quickly as to hardly qualify as proper songs nearly vanish, “Coraline” recovers quickly, and then drives to the finish. I am happily suspicious that director Ed Rutherford & friends concocted a scheme to bring this musical to Chicago for its Midwest premiere that was made viable by the creation of a theater company with a name that cannot be separated from the piece at hand, and that Rutherford has passed along his palpable devotion for Gaiman to his crew and cast. 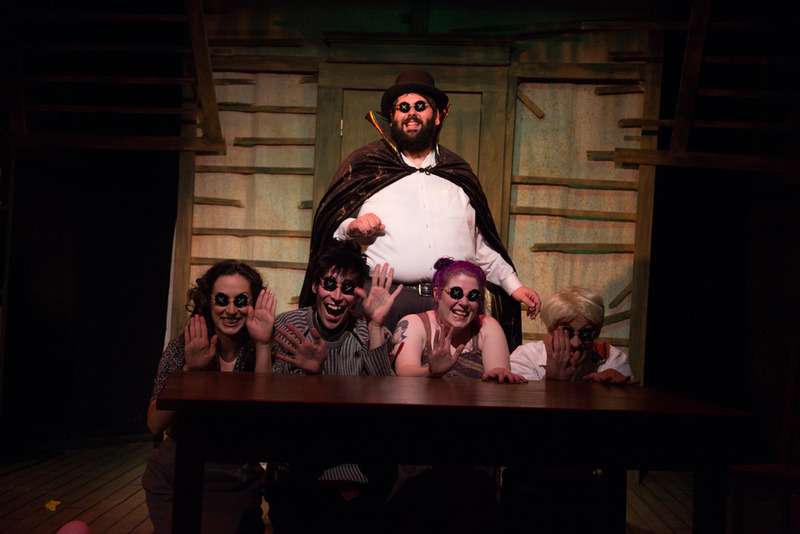 Scenic designer Ryan Emens gives us an authentic, yet toy-like attic in City Lit’s adaptable black box, and lighting designer Chazz Malott does great work creating fantastical stage pictures, given the challenges of such an intimate space. Black Button Eyes Productions at City Lit Theater, 1020 West Bryn Mawr, Second Floor, CoralineChicago.com, $25. Through September 6.